Show your pride and professionalism with the CRRN pin. 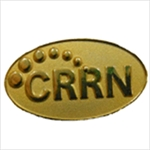 Display your certification proudly by wearing your own gold CRRN pin. By doing so you show your support for certification and pride in your professional achievement. Only CRRNs may wear the CRRN pin.